Oceanside is bordered by Marine Corps Base Camp Pendleton to the north and the Buena Vista Creek and Lagoon to the south. Like many Southern California beach towns, Oceanside’s dominant feature is its coastline -- 3.5 miles of sandy beaches -- where it hosts surf contests throughout the year. 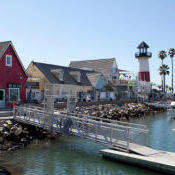 It also boasts North County’s sole public marina with more than 1,000 boat slips and a municipal pier. The low-key beach vibe complemented by a municipal airport, Amtrak and Sprinter stations make a natural tourist destination. Tucked between the ocean and Marine Corps Base Camp Pendleton, Oceanside occupies 42 square miles. Although most of Oceanside lies east of Interstate 5 and has a suburban feel, its heart and soul runs along Pacific Coast Highway. According to the 2010 census, Oceanside has a population of 171,293 with a median age of 35, well below the state median age of 45. The estimated median household income is $55,620. The California Surfer Museum is dedicated to preserving surfer and beach artifacts and history. The Oceanside Historical Society maintains a museum and archives about Oceanside in its restored fire station building. The Oceanside Museum of Art is located in the Civic Center and showcases regional, ethnic and local artists. The third-largest city in the county, for decades Oceanside has been known as a military and vacation home town. In recent years, the city has worked to transform downtown into a bustling, walkable district. New hotels, more upscale shops and restaurants, and craft breweries are on the way.